As a test, the executive summaries of the recent activities will be downloadable. Those are only available in French or Dutch. This will require a username and password, that is known to the members. If you forgot, or if you want to register your IP address, contact me. On Tuesday afternoon November, 12 , 2002 at 14.30 in the room of the National committees in the Royal Stables of the Palace of the Academies, the committee has prepared the decannal edition of it's Forum. In the scientific part, scheduled between 14.30 and 15.30 Prof. Manu Van Lil has been pleased to give a lecture: "On the influence of windturbine parks on maritime radio frequency communication and navigation systems (E)". If you wish you can download the slides in pdf format (6,3 Mbytes!!!!) here . The following meeting was held Tuesday afternoon February, 04 , 2003 at 14.30 in the room of the National committees in the Royal Stables of the Palace of the Academies. In the scientific part, scheduled between 14.30 and 15.30 Prof. Christophe Craeye has given a lecture: "Simulation of infinite and finite arrays of broadband antennas (E)". In the next meeting, on May, 6, 2003 at 14.30 in the room of the National committees in the Royal Stables of the Palace of the Academies, Prof. Eric Michielsen (University of Illinois) has given a very attractive lecture on "Fast Mathematical Algorithms and Simulations of the Real-World Problems (E)". The last meeting of the academic year 2002-2003 was held on September, 30, 2003 at 14.30 in the room of the National committees in the Royal Stables of the Palace of the Academies. It started with a lecture of Prof. dr. ir. Thierry Dutoit (University of Mons) on "From speech to other biological signals: a survey of ongoing projects in biomedical engineering at FPMs(E)", and discussed the arrival of some new associated members and the preparation of the new Forum at the academies. The next meeting was held on December, 2, 2003 at 14.30 in the room of the National committees in the Royal Stables of the Palace of the Academies. The scientific lecture was given by Dr. Johan De Keyser, werkleider ai BIRA-IASB on "Surface waves on the Earth's magnetopause: A Cluster perspective (E)". The next meeting has been held on February, 17, 2004 at 14.30 in the room of the National committees in the Royal Stables of the Palace of the Academies. The scientific lecture was given by Prof. dr. ir. Patrice Mégret, FPMS, on "Optical fibre metrology (F)". The administrative part discussed the past and next Forum. The next meeting has been held on May, 11, 2004 at 14.30 in the room of the National committees in the Royal Stables of the Palace of the Academies. The lecture was very appealing but still of high scientific quality and was given by Prof. dr. ir. Hugo Thienpont, VUB/TONA, on "Opportunities and Challenges in Photonics (E)". The administrative part was already preparing the general assembly in New Delhi, India next year. The next meeting has been held on September, 14, 2004 at 14.30 in the room of the National committees in the Royal Stables of the Palace of the Academies. The lecture was given by Prof. dr. Gottfried MANN of the Astrophysikalisches Institut Potsdam (GE) and has discussed: "Flare Waves at the Sun (E)". The administrative part has prepared the general assembly in New Delhi, India next year and the Forum 2004. The next meeting has been held on November, 16, 2004 at 14.30 in the room of the National committees in the Royal Stables of the Palace of the Academies. The lecture was given by dr. Odara Thongsamouth of the ERM. She has presented the results of her interesting "Theoretical and experimental study of the ELF electromagnetic field distribution emitted by a submerged dipole source in shallow water (E)". The administrative part has prepared the general assembly in New Delhi, India next year and the Forum 2004. The next meeting was held on February, 8, 2005 at 14.30 in the room of the National committees in the Royal Stables of the Palace of the Academies. The scientific lecture was given by dr. Viviane Pierrard of the BISA. She unraveled the mysteries of the "Plasmasphere (F)". This plasmasphere ends at the plasmapause, where the particle densities decrease abruptly. It extends in the magnetic equatorial plane of the earth from 2 to 7 earth radii, depending on the geomagnetic activity. The administrative part has prepared the general assembly in New Delhi, India, this year and discussed with our Dutch colleagues the organisation of a common Forum in 2006. The next meeting was held on June, 2, 2005 at 14.30 in the Royal Military College. After a visit to the reverberation chamber, used for immunity measurements (EMC, public health) Commander (Air component) Ir. Th. Gilles of the LEMA, chair TELE, department CISS/KMS has lectured about: "The LEMA (Laboratory for applied ElectroMAgnetism) and the project for simulation and measurements of complex EM-fields in an urban environment (F)". The administrative part has made the final arrangements for the general assembly in New Delhi, India. The next meeting was held on September, 20, 2005 at 14.30 in the room of the National committees in the Royal Stables of the Palace of the Academies. The scientific lecture was given by mr. Aimad Saib from CISSOID SA over "Microwave applications of ferromagnetic nanowires and materials (E)". In the administrative part a new board and new effective members have been elected. The next meeting was held on December, 6, 2005 at 14.30 in the room of the National committees in the Royal Stables of the Palace of the Academies. The scientific lecture has been given by Xavier Rottenberg and has discussed "Electrostatic RF-MEMS devices in thin film technology (E)". The administrative part discussed a.o. the general assembly in Delhi. The next meeting was held on April, 27 , 2006 at 14.30 in the room of the National committees in the Royal Stables of the Palace of the Academies. The scientific lecture has been given by Dimitri Linten and has discussed "ESD-protection of deep sub-quarter micron CMOS technology (E)". The administrative part discussed a.o. the BENELUX Ursi meeting in Eindhoven. The next meeting has taken place on Tuesday Afternoon, August 26, 2008 in the Jules Bordet room of the Palace of the Academies. The next meeting has taken place on Tuesday Afternoon, December 16, 2008 at 14.30 in the Palace of the Academies. The scientific lecture was given by Christophe Craeye and was dealing with "Fast analysis of finite antenna arrays: reconciling finite and infinite-array approaches with the help of the Array Scanning Method (E)". The next meeting has taken place on Friday Afternoon, March 20, 2009 at 14.30 in the Palace of the Academies. Hendrik Rogier has given some details about: "Indoor off-body communication based on a textile multi-antenna system integrated in clothing for rescue workers (E)". The next meeting has been held on May, 6 , 2009 at 14.30 in the room of the National committees in the Royal Stables of the Palace of the Academies. Our president, Prof. Schweicher has given a lecture on "Laser Security & Laser Applications (E)". If you wish you can download the slides in ppt format (8,1 Mbytes!!!!) here . The next meeting was held on November, 13 , 2009 at 14.30 in the room of the National committees in the Royal Stables of the Palace of the Academies. Prof. Christine Demol gave an interesting talk about "Sparsity: a new paradigm in applied sciences (E)". At this occasion, one of the honorary presidents of URSI international, Prof. Van Bladel, honoured us with his presence, and congratulated the winner of the contest of the 2009 URSI forum, mr. Xavier Radu. Both have been able to know each other better at the occasion of the handing over of the second edition of the second edition of the literally and figuratively heavy book "Electromagnetic Fields". The next meeting was held on February, 2 , 2010 at 14.30 in the room of the National committees in the Royal Stables of the Palace of the Academies. Dr. Ben Lauwens gave an interesting talk about "Stochastic Hybrid Simulations with Applications to Telecommunication Networks (E)". The next meeting was held on May, 25 , 2010 at 14.30 in the room of the National committees in the Royal Stables of the Palace of the Academies. Dr. Christophe Marqué gave an interesting talk about "Monitoring of the Solar Activity with Radioastronomy Techniques (E)". The next meeting was held on Tuesday October, 19 , 2010 at 14.30 in the room of the National committees in the Royal Stables of the Palace of the Academies. Prof. dr. ir. Xavier Neyt gave an interesting talk about "Bistatic and opportunitic radars (E)". The next meeting was held on Tuesday February, 1 , 2011 at 14.30 in the room of the National committees in the Royal Stables of the Palace of the Academies. Dr. Hervé Lamy gave an interesting talk about "BRAMS: a new facility to characterise and detect meteors (E)". The next meeting was held on Thursday June, 9 , 2011 at 14.00 in the room of the National committees in the Royal Stables of the Palace of the Academies. ir. Pascal Druyts gave an interesting talk about "Analyzing the Effect of the Environment on Electromagnetic Induction Sensors (E)". The next meeting was held on Wednesday September, 28 , 2011 at 14.00 in the Quetelet room of the Palace of the Academies. A new effective member was elected (Prof. Yves Rolain from the VUB) as wel a new president and vice-president. The next meeting was held on Thursday, December, 8 , 2011 at 14.00 in the Bordet room of the Palace of the Academies. Our new member, Prof. Yves Rolain has given an extremely interesting lecture on "Using the Best Linear Approximation to characterize nonlinear RF and microwave systems (E)". A new effective member was elected as wel as a new secretary and vice-secretary, a new associate member and 2 honorary members. The next meeting was held on Thursday, March, 22 , 2012 at 14.00 in the Bordet room of the Palace of the Academies. Our new member, Dr. Vladimir Volskiy has given a very interesting lecture on "Antenna arrays with baseband electronic beam steering for telecommunication applications (E)". The next meeting was held on Thursday, June, 28 , 2012 at 14.00 in the council room of the department of bio-engineering of the KU Leuven (campus Heverlee-Arenberg). Note the unusual location, due to the complete unavailability of any room in the Palace of the Academies. Dr. Jean-Claude Jodogne has given two attractive shorter lectures on "1) The new ionospheric sounder in Dourbes. and 2) Cosmic rays and clouds (E)". The next meeting was held on Monday, August, 27 2012 at 14.00 in the Bordet room of the Palace of the Academies. The scientific lecture will be replaced by the evaluation of the papers for the next URSI forum. The next meeting was held on Monday, November, 26 2012 at 14.00 in the Bordet room of the Palace of the Academies. The scientific lecture was given by Prof. Meessen on pulsed electromagnetic propulsion. Some very original ideas were discussed during this series of lectures, so that this part took about twice as long as usually (2 hours). At the beginning of the administrative part, a minute of silence was observed in honour of our deceased honorary member, Prof. ir. Michel Gewillig. The next meeting was held on Monday, February, 13 2012 at 14.00 in the Bordet room of the Palace of the Academies. The scientific lecture was given by dr. Stankov on the ionospheric research at the National Meteorological Institute. The next meeting was held on Tuesday, May, 21 2013 at 13.30 in the Palace of the Academies. The scientific lecture was given by Prof. S. Pollin on Cognitive Radio. The next meeting was held on Thursday, October, 10 2013 at 14.00 in the Palace of the Academies. The scientific lecture was given by Prof. C. Oestges in the library room and discussed his contributions in the COST channel models. The next meeting was held on Tuesday, January, 21 2014 at 14.00 in the Palace of the Academies. The very objective and critical scientific lecture about biological effects of microwaves (F) was given by Prof. em. A. Vander Vorst. He kindly agreed to provide his slides to all who would like to have them. The next meeting was held on May, 28 2014 at 14.00 in the Palace of the Academies. The scientific lecture was given by our new member, Prof. Thierry Gilles on "Near and Far Field HF Antenna Parc Characterization (E)". The next meeting was held on November, 7 2014 at 14.00 in the Palace of the Academies. The scientific lecture was given by our new associated member, Prof. Wout Joseph and will deal with "Exposure due to Electromagnetic Fields of LTE (4G) and New Wireless Technologies in Different Environments(E)". The administrative part renewed the board and elevated Prof. Lagasse to the rank of honorary member. Prof. Van Daele xill replace him as effective member. Prof. Wout Joseph joined us as associated member. The next meeting was held on July, 10 2015 at 14.00 in the Palace of the Academies. The scientific lecture was given by Prof. Emmanuel Van Lil and discussed the "Efficient low frequency stabilisation of electromagnetic intergral equations (E)". The administrative part nominated Prof. Xavier Neyt as effective member. Prof. Hendrik Rogier has accepted to become vice-secretary. The next meeting was held on December, 18 2015 at 14.00 in the Bordet room of the Palace of the Academies. There was no scientific lecture. The discussions were about the Forum held in Enschede and the next Benelux Forum, as well as the next AP-RASC. The problems with the paiment of the dues to the international bodies were raised, but those are outside our power, except by writing support letters to the academies. The next meeting was held on May, 23 2016 at 14.00 in room 2 NO 906 of the ULB (Triumph Blvd.). The scientific lecture was given by Prof. Vincent Ginis and discussed the "Metamaterials and transformation optics: nanophotonics turns science fiction into reality (E)". The administrative part nominated dr. Hervé Lamy as associate member. The next meeting was held on December, 20 2016 at 16.00 in the Bordet room of the Palace of the Academies. The scientific lecture was given by Prof. Virginie Kubica and discussed the "Bistatic Opportunistic Synthetic Aperture Radar (SAR) Imaging (E)". The next meeting was held on May, 22 2017 at 16.00 in the Bordet room of the Palace of the Academies. It was essentially devoted to the preparations of the triannual general assembly of URSI in Canada this year. The next meeting was held on March, 19, 2018 at 16.00 in the Bordet room of the Palace of the Academies. The scientific lecture was given by Helio Fernandez and discussed the "Quantification and modelling of periodic breathing instabilities (E)". It was devoted a.o. to the election of the new board and debriefings of the latest conferences. The next meeting was be held on Novenber, 12, 2018 at 10.00 in the reading room of the Palace of the Academies. The scientific lecture was be given by Hendrik Rogier and discussed "Novel antenna dedign paradigms for sustainable wireless communicatiuons (E)". It was also devoted a.o. to the election of two new associated members. A tradition, instaured by one of our dynamic past-presidents (now back in charge), Prof. Schweicher in 1993, is the URSI Forum. Up to 2005, it was organise alternatingly in a Flemish and a French univeristy. Since then it is organised at the royal academy of Science of Belgium and at a Dutch University. The purpose is to give the occasion to young researchers to present their doctoral work and to discuss it with the other Belgian specialists in their domain. An introductory guest speaker will be invited, to summarise a theme of interest for radiocommunications in general. As long as the supplies are not exhausted, some copies of the proceedings may still be ordered from the secretariats of the different universities. On December, 10, 1993 the FORUM was held at the RMA. The host was Prof. Emile Schweicher. On December, 9, 1994 at the UCL. The hosts were Prof. Auguste Laloux and Prof. Paul Delogne. 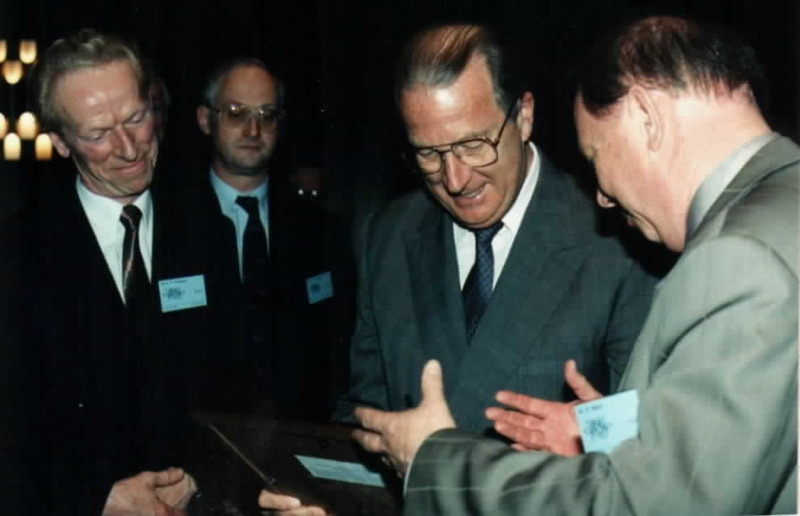 On December, 13, 1995 at the K.U.Leuven in the castle of the dukes of Arenberg.The host was Prof. Emmanuel Van Lil. On December, 11, 1996 at thE FPMS in the large auditoria. Our host was Prof. Michel Blondel. On December, 10, 1997 at the RUG in the room "het pand". Our host was Prof. Peter Van Daele. The URSI FORUM 1998 has been held at the VUB. Our host, Prof. Alain Barel has reserved the room "onder de Aula" and the STOA on thursday December, 10. In 1999 Prof. Serge Prohoroff of the ULB has accepted to host this FORUM on friday, December 17. More information including a call for papers and registration form can be found in FORUM99 . The FORUM2002 has been hosted by Professors Claude Vloeberghs, Emile Schweicher and Marc Piette of the TELE and OMRA divisions and their groups at the Royal Military Academy on Friday, December 13, 2002. It was a big success. Look at the pictures . In 2003, on Thursday December, 18 , Prof. Bart Nauwelaers, Dominique Schreurs, Manu Van Lil, Guy Vandenbosch and Antoine Van de Capelle from the ESAT/TELEMIC division with their groups have organised the FORUM in the Royal Academy. The proceedings are available electronically in pdf format (2 Mbyte!) with the URSI password by clicking here . Once again, it was a big success. Look at the pictures . In 2004, on Friday December, 10 , Prof. Michel Blondel and his team from the SET division of the FPMS has organised the FORUM again in the Royal Academy. As in 2003, the forum has been sponsored by both academies (French and Flemish). In 2006, On Friday, May, 12, the URSI Forum entitled "Radio Science in the Benelux" was held at the T.U.Eindhoven, start at 10.00 and end at 16.30. In 2008, on Friday May, 30, the ESAT/TELEMIC division with their research groups have organised the FORUM in the Royal Academy, together with their Dutch URSI colleagues. A description of how to get to the palace of the academies can be found (in 3 languages) as a PDF file on their web site http://www.kvab.be. A registration form in word format can be found here . The time schedule of the day is already available and can be downloaded also in word format here . Instructions for authors in word format can be found here . In 2008 the forum was sponsored by the Flemish academy (KVAB). The 2009 Benelux URSI Forum was held at the TUDelft, on Monday, June, 8. We thank the Dutch committee and the Delft hosts (Prof. De Hoop, Lighthart and Yarovoy and their teams) for their excellent organisation. In 2010 Prof. Erik Stijns from the VUB and his team and colleagues have hosted the Forum on May, 18, 2010 at the palace of the academies in Brussels. The 2011 Benelux URSI Forum was held at ESTEC, on Monday, June, 6. We thank the Dutch committee and the ESTEC hosts (Prof. Arbesser-Rastburg, Kees Van 't Klooster and their teams) for their excellent organisation. The 2012 Benelux Forum was organised on Friday September, 14 by the Universiteit Gent and the teams of Prof. Peter Van Daele and Hendrik Rogier. The 2013 Benelux Forum was organised on Friday April, 19 by Technische Universiteit Eindhoven and the Dutch committee. A few pictures can be found by clicking on the link. The 2014 Benelux Forum has been organised on Tuesday November, 18 by our colleagues of the UCL in Louvain La Neuve. The time schedule of the day is available and can be downloaded in pdf format here . The 2015 Benelux Forum was organised on Monday December, 7 in Enschede at the University of Twente by Prof. Mark Bentum and his team, with the support of the Dutch committee. The 2017 Benelux Forum was organised on Thursday February, 16 in Brussels at the Royal Military Colleg by Prof. Xavier Neyt and his team, with the support of the Belgian committee. Those Fora have been sponsored up to now by the academy (since 1996), the FNRS and the French community (both since 1995), the FWO-Vlaanderen (in 1998 and 2002), Siemens Belgium (in 1996), Philips and Astron in 2006 and the different laboratories that have saved neither effort nor money for the benefit of those Fora. 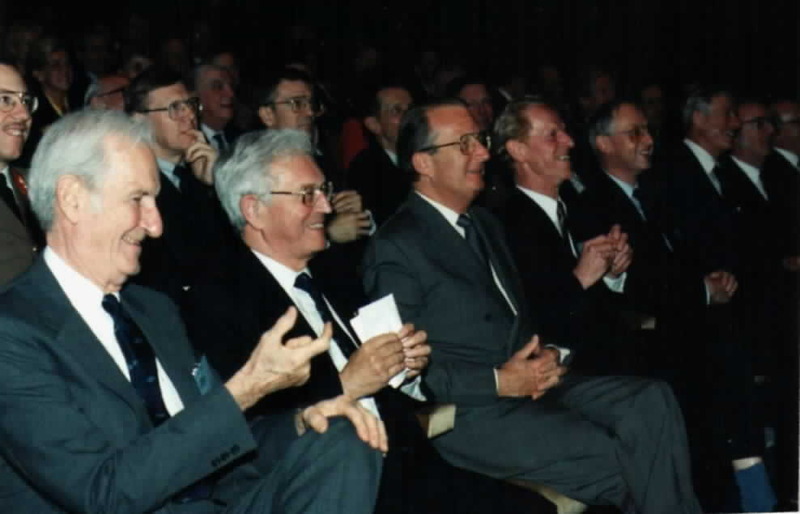 Exceptional celebrations have been held at the ocasion of the 60th (1980) and the 75th anniversary (26 en 27 april 1995) of URSI(international), both in Belgium with great decorum (in the presence of our King Albert II) and with an extended symposium on the applications of radiowaves in space. Prof. Van Bladel sitting just right of His Majesty King Albert II. Some proceedings can still be obtained at the URSI general secretariat (mrs. Inge Heleu) for 12,5 EURO. This includes mailing within Europe. The shipping charges for countries outside Europe are 3,5 EURO.